So, one of my FAVOURITE leading-up-to Christmas traditions is sitting by my gorgeous lit up tree, wine in hand, lights off, and the smell of Christmas-y candles burning. NOTHING is cozier, you guys. I’m a huge candles person. 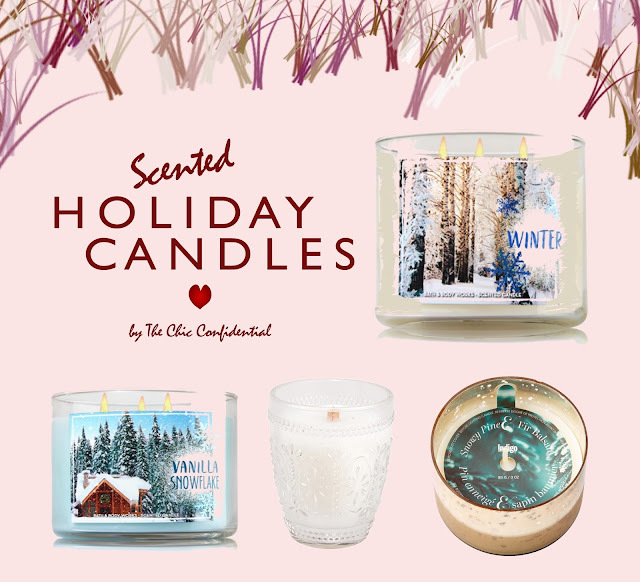 The smell, the sound, the vibes, the ambiance…it’s all just so appropriate for the Holidays. I mean, I’m a candles person all year round, but over Christmas, I just get wayyy too excited and buy everything. WINTER | This one is a Bath & Body Works fave! It’s 3-wick and made using the highest concentration of fragrance oils. If you don’t like a strong smell, this one isn’t for you. However, in a big space, this won’t be too strong. The smells are amazing!! Think white wood, pine needles, clementines, and spiced cloves. YUM. VANILLA SNOWFLAKE | This one is another popular one from Bath & Body Works. It’s very light and calming. It’s also 3-wick, and smells of vanilla, iced fir, mint, and coconut flakes. You can actually smell a little bit of everything in there. Which is why I love this one so much! Also, anything that’s coconut related, I’m obsessed with. Bounty chocolate, coconut oil, Coconut chips, and the list goes on. If you’re gearing up for the Christmas season, and have no idea what to buy someone, candles make the perfect stocking stuffers. I mean, I can’t get ENOUGH candles. They are all over my place and my home just smells like Christmas all the time. What more can you ask for, right? Any other candle lovers out there? What are your faves? Share! I’m going to get cozy with some Riesling and another episode of How To Get Away With Murder, all candles lit of course. Previous Post Dressing For Success. Next Post Console Table Décor For The Holidays.